"In this book, (Don Hamilton) carefully and clearly lays down the essential knowledge needed to use homeopathy successfully. To read this book is to prepare you to help your animal with the many day-to-day vicissitudes of life…take some time, read this book carefully, and learn of one of the greatest discoveries in the history of medicine. We are fortunate to have a healer of Dr. Hamilton's stature take us on this journey." "Dr. Don Hamilton is one of the most experienced, creative, and open-minded homeopaths for animals in this country. He brings his years of veterinary practice and perceptive understanding of homeopathy to this book to expand your knowledge and to help the animals in your life. We are fortunate that he is sharing his wisdom. This book should be added to any animal lovers bookshelf." Don Hamilton, D.V.M. is a conventionally-trained veterinarian who has been practicing medicine for twenty years. He has been practicing veterinary homeopathy for thirteen years and has taught in the professional homeopathic veterinary course sponsored by the Academy of Veterinary Homeopathy. Hamilton did his early training in homeopathic veterinary care with Dr. Richard Pitcairn; he has also studied with world-renowned homeopaths such as Francisco Eizayaga of Argentina, Rajan Sankaran of India, Alize Timmerman of the Netherlands, and Jungian homeopath Edward C. Whitmont of the U.S. He maintains a practice in New Mexico. 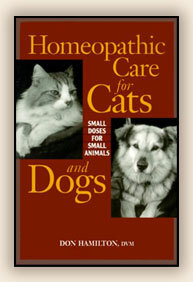 Homeopathic Care for Cats and Dogs is also full of a wide-variety of valuable holistic care tips!